Duality is the condition of being two, of having two parts usually with opposite meanings, two splitting parts stemming from one unit like the existence of good and evil in human nature. Duality is present in the enigmatic nature of mankind - up and down, peace and war, love and hate, etc. The idea of opposites (Yin-Yang, the union and harmony of opposites) has existed in both Eastern and Western philosophy since ancient times. Duality has been farther examined, it has technical meanings in geometry as well as physics, and it can be challenging. However, for this show we aim to get into a playful, free-spirited investigation using art and a great dose of audacity! 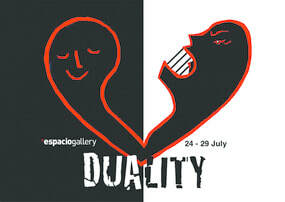 Duality Expanded focuses on the works of 5 artists from the current Duality exhibition. Each artist offers a different and unique interpretation around the concept of Duality. 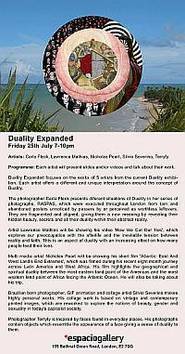 Each artist will present slides and/or videos and talk about their work.